Of course the Diablo is not simply larger than the Moor; it is also more dramatically carved. Look how the shape of the chin is outlined in relief. 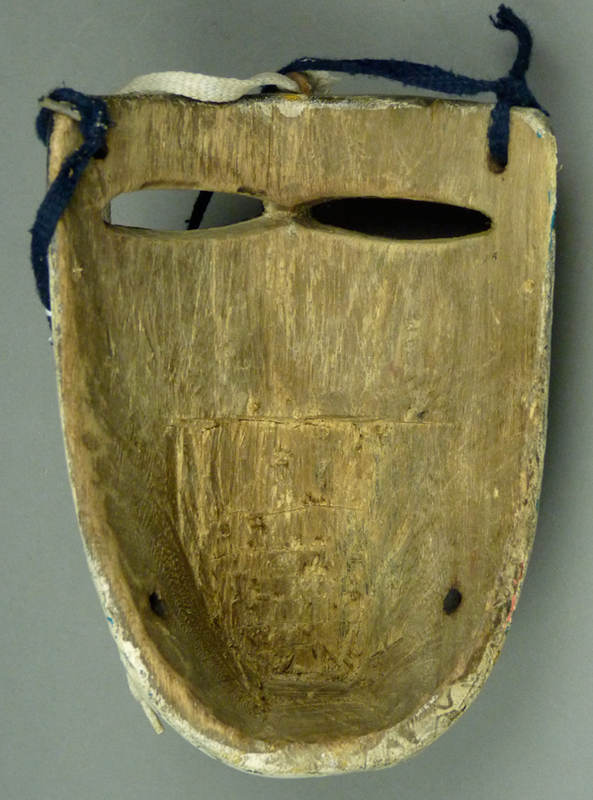 There are relief carved eyes under the vision slits, and the numerous teeth have been created with wooden implants. The hairline is also carved in relief on the sides. The horns were obtained from a goat. There is a double chin or perhaps a beard that has the shape of a partial disk. 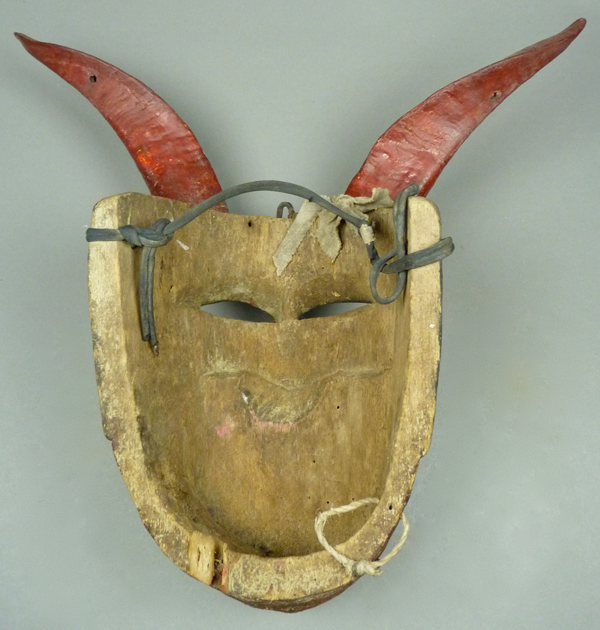 This mask is 10 inches tall, 7½ inches wide, and 5½ inches deep, not counting the horns. The spread of the horns, from tip to tip, is 16 inches. The back shows moderate wear. 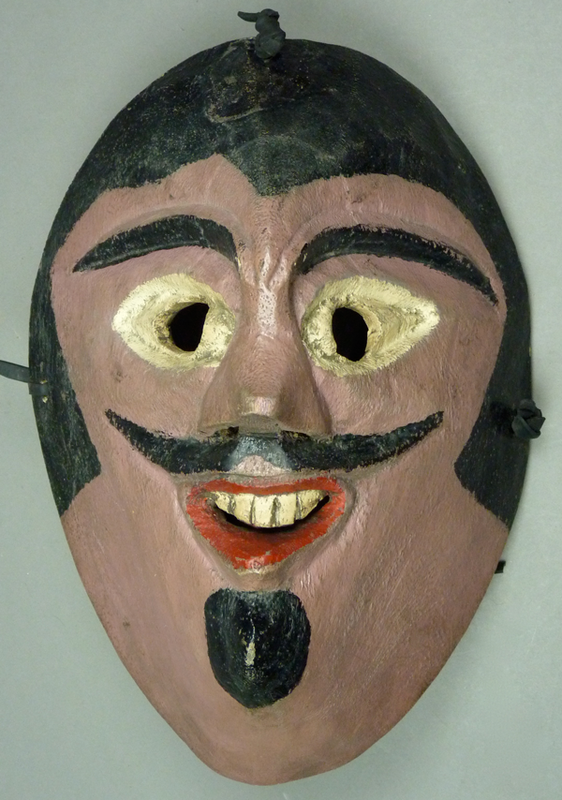 Here is the Carnival Moor in closer views. 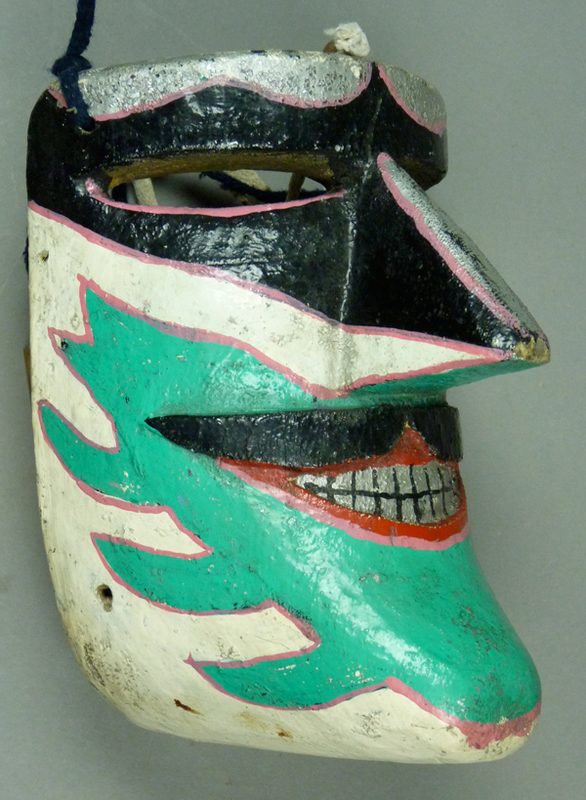 This mask has vivid colors. 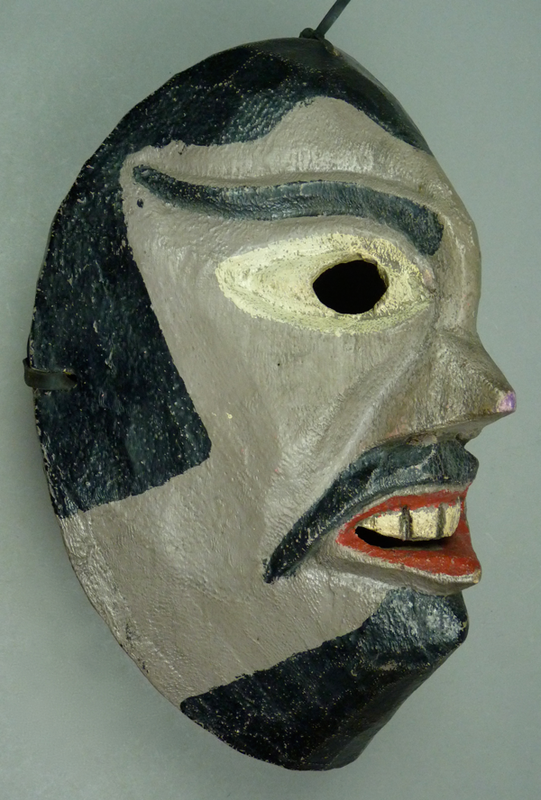 The Moor mask is 7 inches tall, 5 inches wide, and 4 inches deep. There is convincing evidence of wear. The holes for the straps (or strings) were burned through the wood with a heated iron rod. However in recent years many carvers have electric drills. At this point I will shift from a Diablo with horns to a pair of Diablos that lack horns, and picking up on another theme from the two earlier masks, these Diablos resemble oversized versions of Juanegro masks. Furthermore they have contrasting colors, as if they are part of a duality like that of the Juanegros. One might wonder whether the formula for Diablos in Veracruz is to start with some other masks and then increase the size. 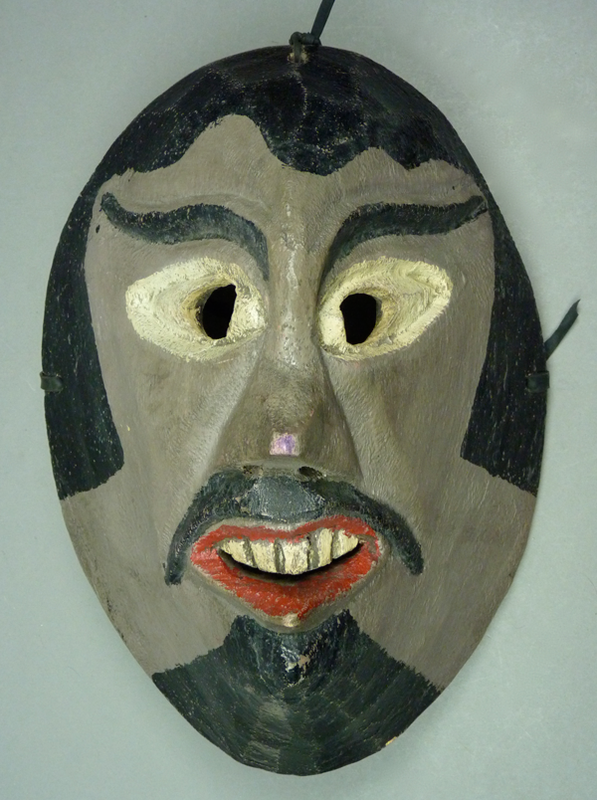 You can look back at Juanegro masks in my posts of September 21, September 28, October 5, and October 12, 2015. I bought these Diablos from René Bustamante in 1995. They were said to be from Tempoal, Veracruz. I will begun with the pink hornless Diablo, flanked by two Juanegro masks, to illustrate the differences in their sizes versus the similarities in their shapes and style. Now I will show the two Diablos at a larger scale, beginning with the pink one. This is not a very malevolent expression. Perhaps this devil is more of a clown or prankster. 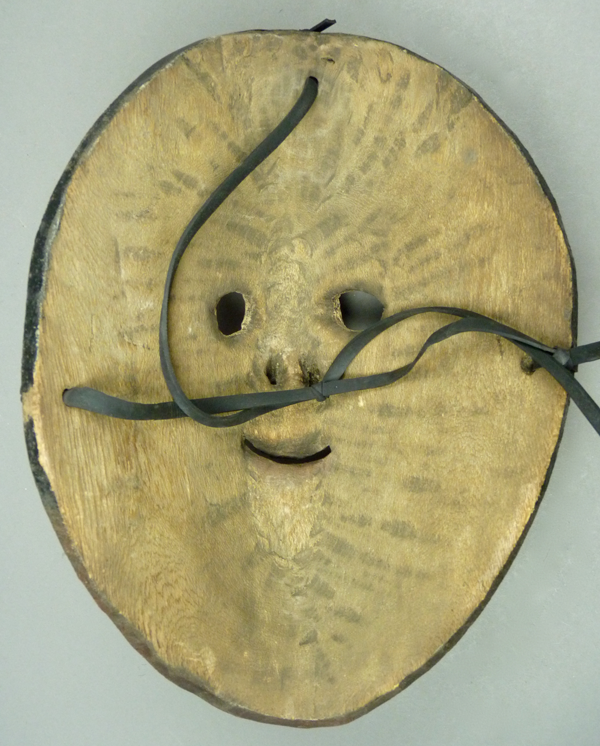 This mask is 11 inches tall, 8 inches wide, and 4½ inches deep. The backs of these two Diablos have such jolly expressions, compared to the front views. 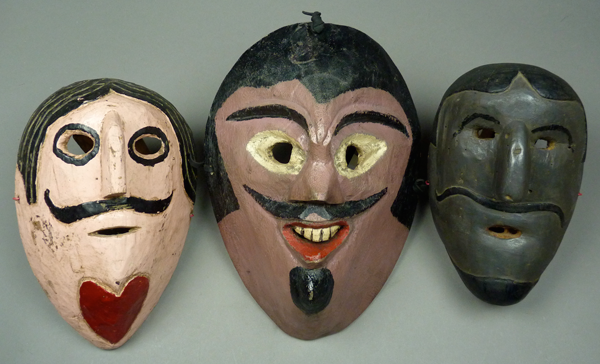 What is less apparent in this photo is how deeply dished these masks are. Both have moderate staining from use. Here is the gray Diablo mask. Note the contrasting differences in their brows and mustaches, raising again the concept of duality—mustache up versus mustache down, arched eyebrows versus the tilde (~) shaped brows on the gray face, and of course pink face versus gray face. 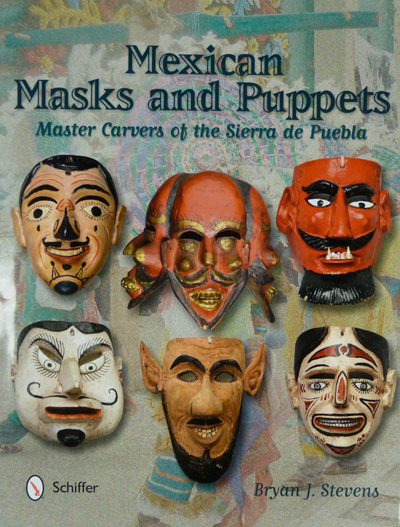 When I wrote my Masks and Puppets book, I was surprised to learn that the Mexican Indians do not view Christ as all good and the devil as all bad. Instead, each is seen through the perspective of duality, as if Christ and the devil are each partly good and partly bad. This led me to theorize that Christ had been co-opted into an Indian religious perspective and that Satan’s image had been recruited as a shell figure that hid old native gods. 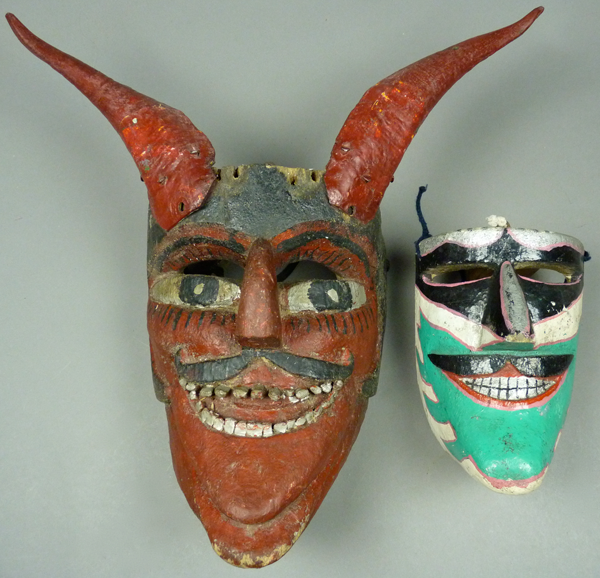 This pair of masks seems to illustrate the duality of a good devil versus another who is bad; they are two aspects of the same character. Despite their benign features, these would be imposing masks, due to their size. 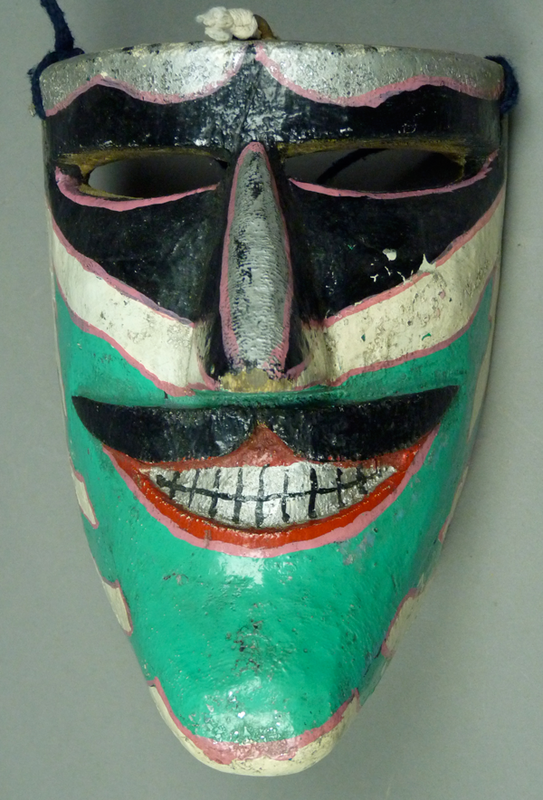 This mask is also 11 inches tall, 8 inches wide, and 4½ inches deep, just like the other. 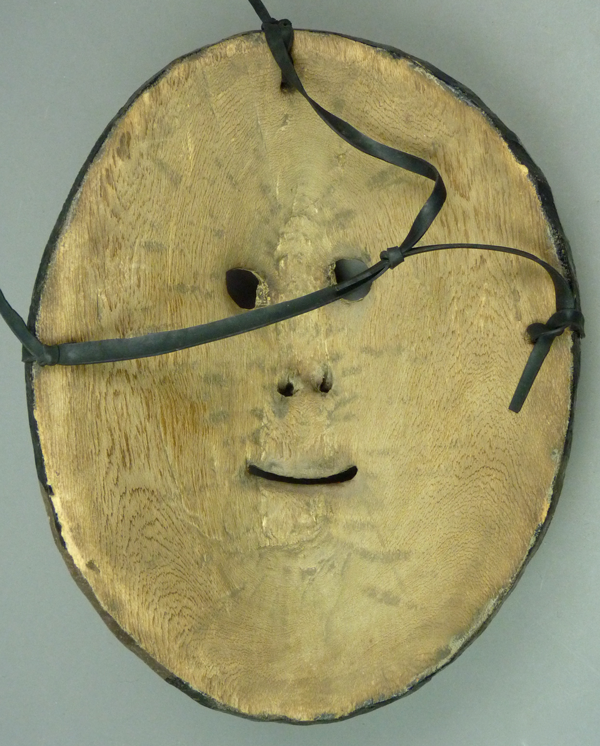 This mask and the other appear to be unhappy on the face and happy on the back—an instance of the front and back duality that we learned about in the blog about the colorful mask with the three dance wands (4/25/2016). 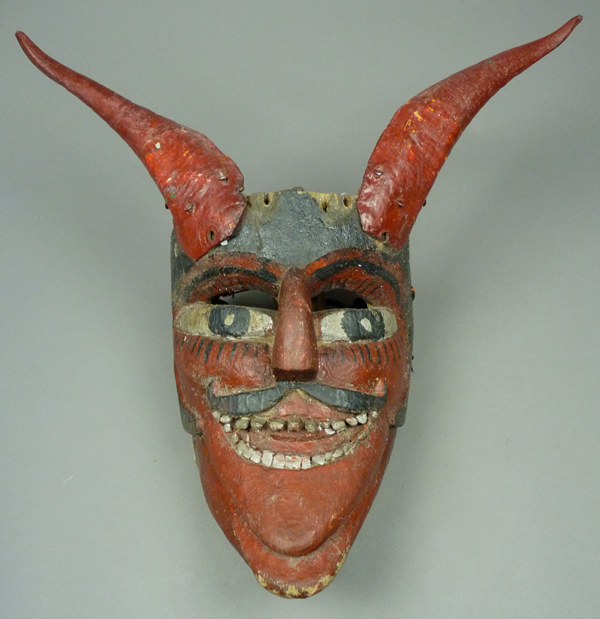 This also reminds me of another front and back duality, the dancers who portray these Diablos are almost invariably faithful Christians; from their contemporary perspective, they portray evil, while they believe in the good. 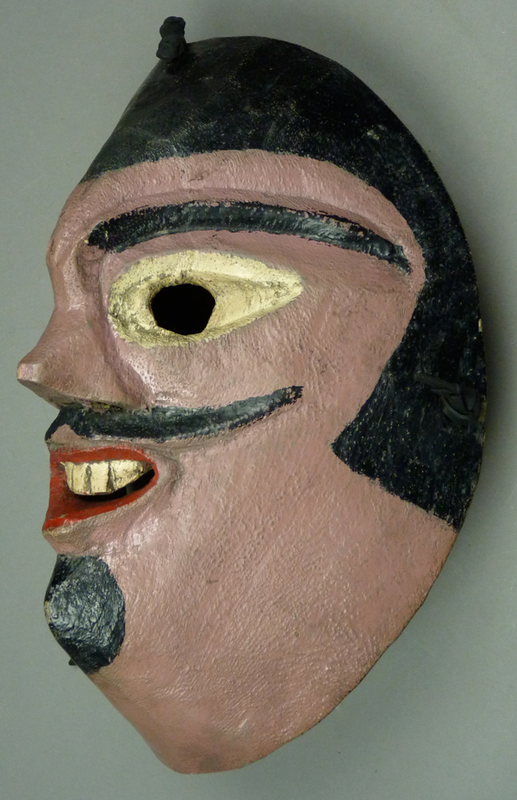 Next week we will examine some masks from Huayacocotla, Veracruz.